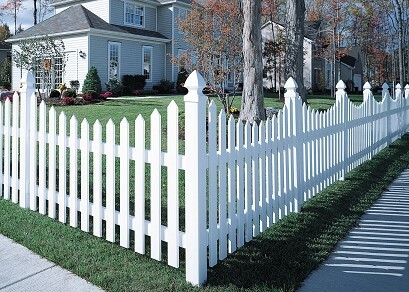 Bufftech offers numerous options to accent your vinyl fence with vinyl fence parts, such as vinyl post caps, lighted post caps, gate hardware, brackets, tools, handrails, and many other cosmetic or functional possibilities. Post caps and lighted post caps are used to top the posts inbetween your sections of vinyl fence to protect both the fence and others. Brackets and bracers are used to attach gates and other extrusions to your fences. So whether you want vinyl fence parts to add to the look, or to fix and repair a section, we offer vinyl fence parts at a discounted price so you may have the extra benefits and cosmetic aethetics on your vinyl fence. Our site specializes in providing only the best vinyl fence parts so you don't have to go far to find everything you need for your vinyl fence. We have the lowest prices on all vinyl fence parts; browse our site and see for yourself. Feel free to call and have a quote appraised for your exact personal needs, or order online. Either way, you save more than anywhere else. Being in the vinyl fence business as long as we have, our influence is able to get us some of the absolute best pricing; which we then in turn, give right back to you. Call now at 1.800.878.7829 to receive a quote tailored to your exact needs and enjoy maintenance-free, high quality vinyl fence parts in just a few days! Vinyl fence parts for all your vinyl fence, compatible with all vinyl fences, just find the right sizes! Vinyl fence parts built specifically for Bufftech series' : Cape Cod, Yorkshire, Danbury, Canterbury, Manchester, Baron, Countess, Monarch Princeton, Victorian, Columbia, Imperial, Millbrook, Chesterfield, Lexington, New lexington, Galveston, Cross Buck, Four Rail, Three Rail, Two Rail, CertaGrain Fences, Kingston, Oxford, Edgewood, Durham, Panorama, and Decking, as well as posts and rails.